Take 42% off the entire book. Just enter code slraaijmakers into the discount code box at checkout at manning.com. Humans do a great job of reading text, identifying key ideas, summarizing, making connections, and other tasks that require comprehension and context. Recent advances in deep learning make it possible for computer systems to achieve similar results. Deep Learning for Natural Language Processing teaches you to apply deep learning methods to natural language processing (NLP) to interpret and use text effectively. 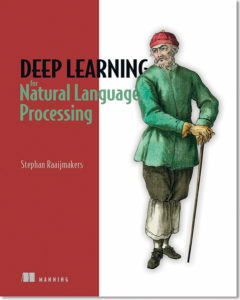 In this insightful book, NLP expert Stephan Raaijmakers distills his extensive knowledge of the latest state-of-the-art developments in this rapidly emerging field. 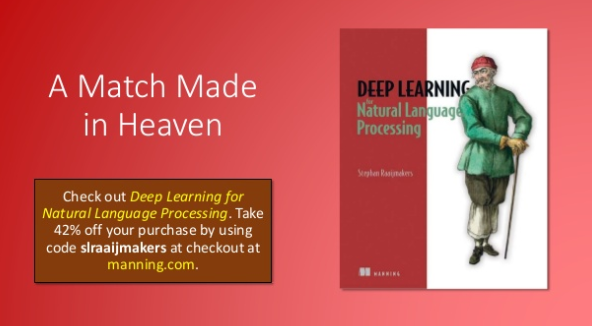 Through detailed instruction and abundant code examples, you’ll explore the most challenging NLP issues and learn how to solve them with deep learning!